One of the vegetables I was really looking forward to growing was parsnips. I just love their sweet delicate flavour when roasted with honey and smothered in gravy. The idea was to harvest them in time for Christmas dinner – which we did! I have a ridiculous amount of them left though and nowhere to store them. 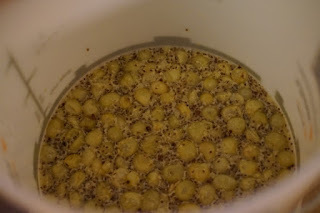 Apart from roasting them, there were no other recipes I wanted to try and since I had an unoccupied fermentation bucket, I decided to start a parsnip wine. WILL LET YOU KNOW HOW THIS WINE TURNS OUT!! A lot of people claim it can be a very nice white wine.